The Boland College logo was designed to represent the mountains, ocean and agricultural land that the Boland region is known for. The logo features a bold design, showing forward motion and innovation that perfectly illustrates the way Boland College operates. Along the way the original logo has been tweaked here and there in order to remain relevant through the changing times. The biggest change involves the colour. The green colour that is used for our logo nowadays, is a very fresh and lively colour that does a great job in symbolising growth and new beginnings, which one associates with an establishment like Boland College. A logo is one of the most important elements of any brand’s identity and therefore needs to be used correctly to ensure that the brand is always represented in the best way possible. The following guidelines should be taken into account when using the Boland College logo. For sandblasting and engraving purposes, the Boland logo provided must be black to ensure the best results. The standard Boland College logo is green. To ensure that it is always shown in the best possible way, we have established a list of background colours that can be used with the logo. These colours have been chosen not only because they complement the colours and design of the logo, but also due to the fact that it fits in well with the look and feel of Boland College. See the list below for the colours that work best with the logo. The Boland College logo in green can be used on grey (Process 0c 0m 0y 80k). The Boland College logo in green can be used on light green (10% of Pantone 383C). The Boland College logo in green can also be used on a white background. The Boland College logo in green can also be used on a black background. 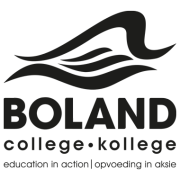 The Boland College logo in black can be used on a white background. The Boland College logo in white can also be used on a black background. If the logo is going to appear on a multicoloured background or on a colour not mentioned here, then the logo must be used in a block consisting of one of the suitable background colours. The logo is often the first real brand element that consumers will make contact with. For this reason, it is important that the logo always be used in the way it was intended. The Boland College logo cannot be used in any of the following manners or any other way that may deduct from the quality of the brand. Improper use of the logo will harm the Boland College brand as a whole, and is therefore strongly forbidden. The logo elements may not be moved around. The colour of the logo may not be changed. Refer to the section above for the correct use of colour regarding the logo. No elements may be removed from the logo. The logo may not be stretched in any way, and must always maintain it’s original proportions. No other fonts may be used on the logo. No extra elements may be added to the logo. Our pay-off line has been chosen because it perfectly represents what we’re about. Many of the programmes offered at Boland College consist of both theory and practical training, which means that students actually learn how to do the line of work they are pursuing. Ultimately, it’s education in action. When the pay-off line is used in conjunction with the logo, the following guidelines apply in terms of the spacing between the elements. Our logo is available in two variations – one with a pay-off line, and one without. The logo without the pay-off line is the standard logo and should be used on all types of documentation, advertising, etc. The secondary logo, which includes the pay-off line, may be used at your own discretion. This section contains useful downloadable items that comply with all the guidelines stipulated in the Corporate Identity Guide. These downloads are essential to anyone working with the Boland College brand.